This so delicious and tender. The port jus sauce enhances the lamb with its smooth, minty flavor with just the right amount of sweetness. Drain off all but 1 tablespoons of the drippings from the frying pan. Add the shallots, onion and garlic and sauté, stirring frequently for 3-4 minutes. Add the Port and stock and bring to a boil over high heat. Cook until reduced b half, about 5 minutes. Reduce the heat to medium. Whisk in the mustard, mint jelly, and then the butter. When the butter has melted and the sauce is smooth, season with salt and pepper. 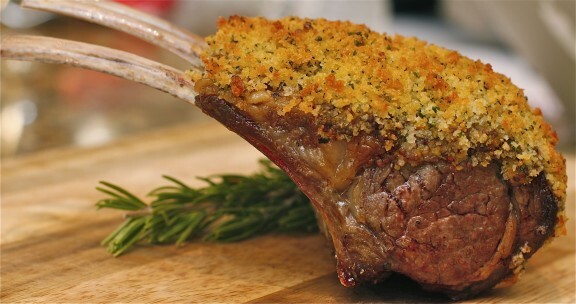 To Serve: Slice the chops in to individual pieces, spoon on the sauce, and serve immediately. ****Fresh Rosemary (leaves to remove from stems slide fingers from top to bottom of stem.